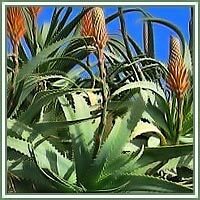 Other names: True Aloe, Indian Alces, Kumari, Barbados Aloe, Lu hui, Curacao Aloe, Gawarpaltra..
Habitat: East and South Africa. However, the plant is extremely adaptable, and the root can survive very low temperatures. 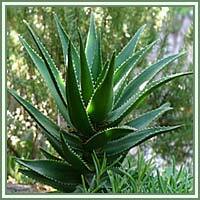 History: Aloe Vera is surely one of the oldest known medicinal plants. The earliest record of her medicinal use was found in a Sumerian tablet at the beginning of the third century BC. Throughout the history, this plant was used as a form of traditional medicine in Egypt, India, China, Japan and Russia. Description: Short, stemless, perennial, succulent plant. Leaves are green to gray green, fleshy, toothed on the margins. The inner leaf tissue contains Aloe Vera gel. During summer, pendulous tubular flowers appear on the flower stalk from the main stem. They are green to bright yellow. Parts used: Mainly the central tissue of the aloe leaf, which contains aloe gel. Useful components: The main constituent is aloin, obtained from the gel in the leaf. The other beneficial constituents are: vitamins A, B1, B2, B3, B6, B12, creatin, creatinine, HDL cholesterol, essential and secondary amino acids, minerals (calcium, zinc, chromium, magnezium, pottasium, phosphorus, iron...). Medicinal use: Aloe Vera has strong healing powers when used both internally and externally. Used internally, Aloe Vera stimulates our immune system, helps stomach disorders by improving our digestive system and destroying abusive fungi and bacteria in the intestinal tract. Dried aloe latex, a substance derived from the leaf, is a strong laxative. Aloe Vera acts as a pain reliever, due to analgesics in salicylic acid. Used externally, Aloe Vera softens the skin, acts as an excellent moisturizing agent, and has a same Ph as the skin. It reaches the deepest body tissues, and therefore has the ability to restore them, proving to be extremely beneficial in the acceleration of the process of wound healing. It can also be used on blemishes and dandruff. Aloe had also shown excellent results in treating facial edema. Used as a mouth rinse, it has shown to be very helpful in cases of cold spores and lockjaw. Safety: Use of Aloe Vera for a long period could result in loss of potassium and fluid imbalance. It should not be consumed during pregnancy, menstruation, breast-feeding and in the cases of an inflamed intestinal disorder. Therefore, it is advisable to consult your doctor before consumption of any herb.